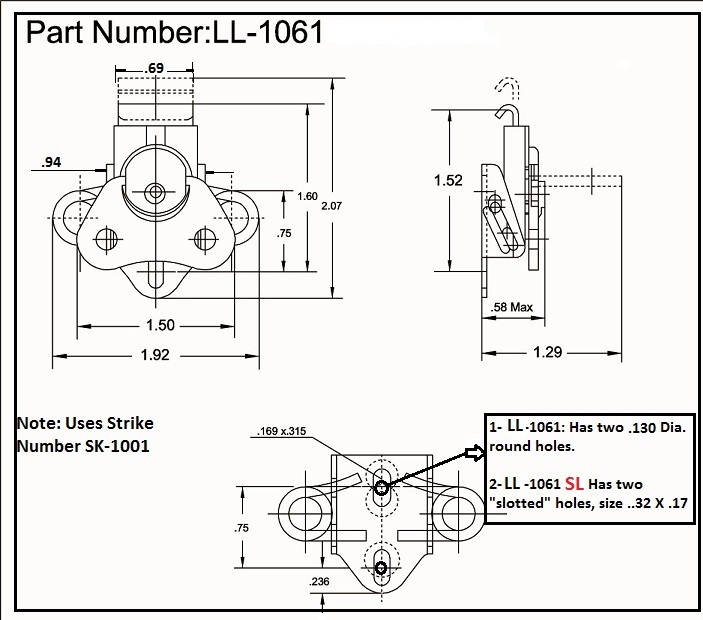 Request a quote for LL-1061 today. JBF National wing turns-link locks are manufactured from the highest quality materials. They are designed and tested for ultimate reliability and durability. LL-1061 is manufactured from either painted black or clear zinc plated steel or passivated stainless steel. This model carries a load capacity rating of 450 Lbs. and features a .130 mounting hole diameter. Please see component diagram below. LL-1061-ST-CZ-130 Clear Zinc Plated Steel / .130 Hole Dia. LL-1061-SS-CP-130 Passivated Stainless Steel / .130 Hole Dia. LL-1061-ST-QA-130 Black Painted Steel / .130 Hole Dia.